More than a year after the cast and crew of Pottersville descended on Hamilton to film, the indie comedy returns to town for its world premiere at the Hamilton Movie Theater. The film’s plot centers on a small-town man named Maynard, played by Michael Shannon, who is mistaken for Bigfoot while drunkenly cavorting in a gorilla costume. The Bigfoot “sighting” causes a media sensation and a flood of Bigfoot enthusiasts to the previously sleepy Pottersville. 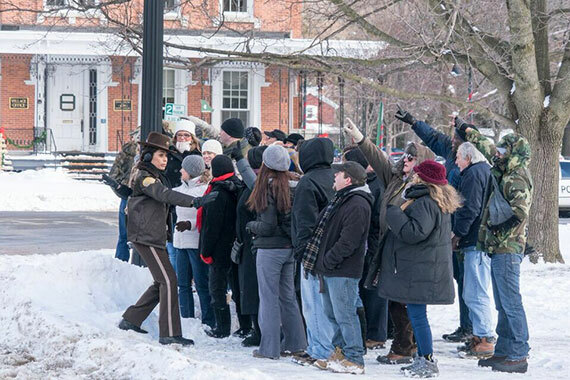 The filming of Pottersville during January 2016 presented exciting internship opportunities for film & media studies students and a month of star spotting for Hamilton residents. In addition to Michael Shannon, the lighthearted comedy stars Judy Greer, Ron Perlman, Ian McShane, Tom Lennon, Christina Hendricks, and Colgate’s own Michael Torpey ’02, who plays an enterprising salesman named Norm. Tickets are on sale now for the premiere event on November 10 at the Hamilton Movie Theater. After the premiere, Pottersville will be screened once a day until November 23. Check out previous Colgate Scene coverage of the Pottersville movie magic here and the story behind Torpey’s souvenir Sasquash T-shirt here.